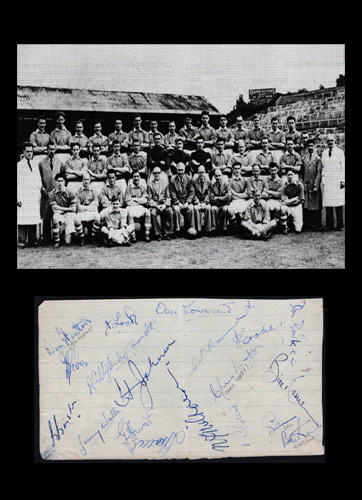 Signed by 17 players: inc SAM BARTRAM, DON BOOKER, PETER CROKER, CHRIS DUFFY, BEN FENTON, DUDLEY FORBES, CYRIL HAMMOND, GORDON HURST, BERT JOHNSON, BILLY KIERNAN, KEN KIRKSTEN, FRANK LOCK, JACK SHREEVE, DON TOWNSEND, ALBERT GEORGE UYTENBOGAARDT, JIMMY WALLS & JIMMY TROTTER (Manager/ Trainer). 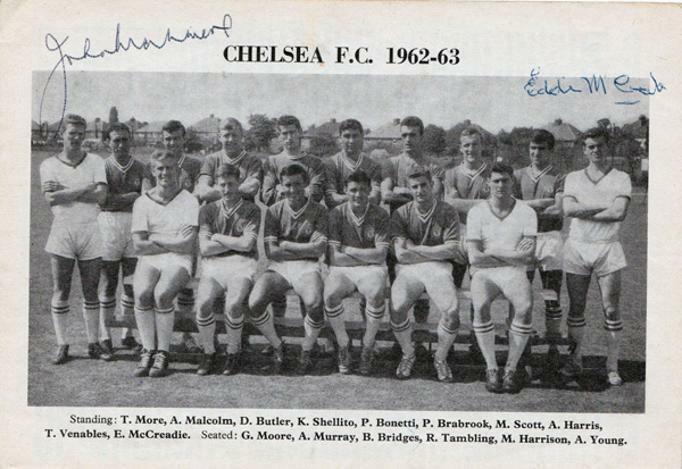 Multi-signed team pic from a Chelsea FC programme. 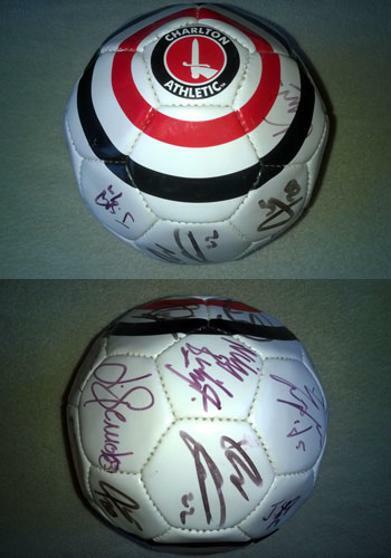 Signed by Brian Tocknell (not pictured), Fred Lucas, John Hewie, Marvin Hinton, John Henderson (not pictured & did not play), Dennis Edwards, Roy Matthews, Brian Kinsey & Keith Peacock (not pictured). 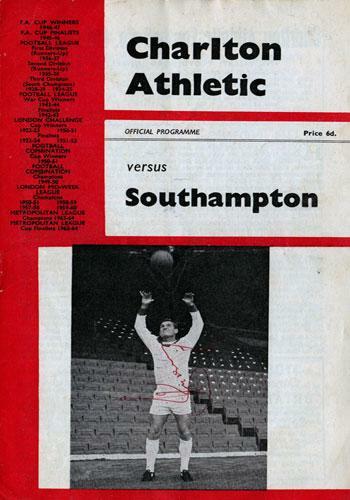 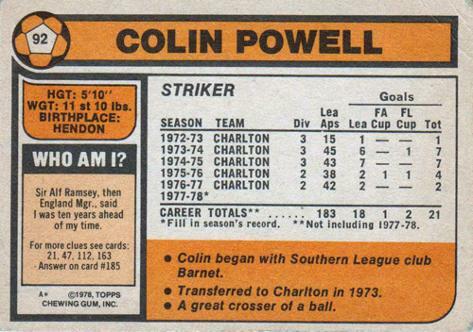 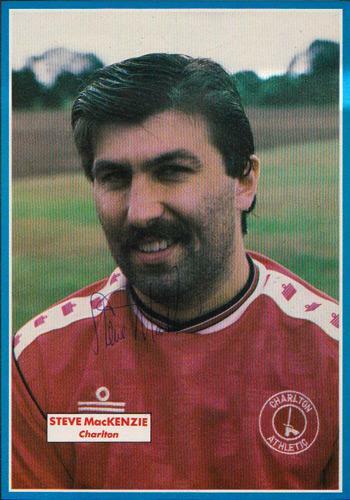 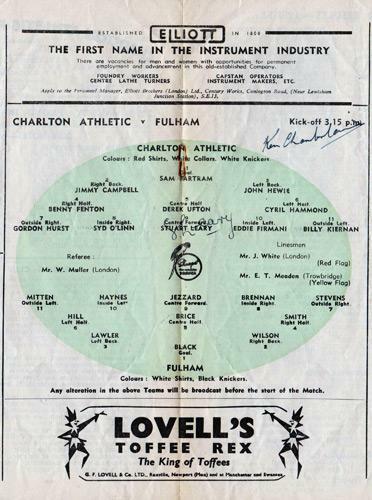 The only CAFC player to play in this game (25 Aug 1962) and not sign was John Sewell. 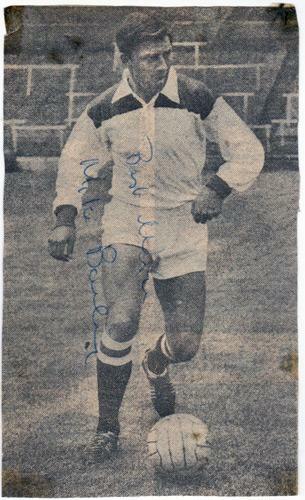 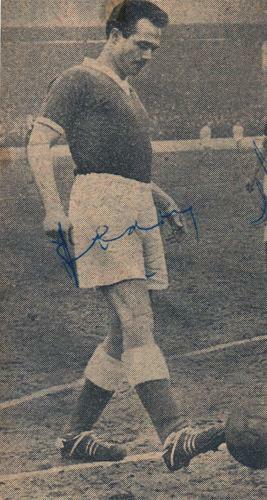 Mike Bailey (not pictured or signed in the team pic) signed the team line up page along with Roy Matthews. 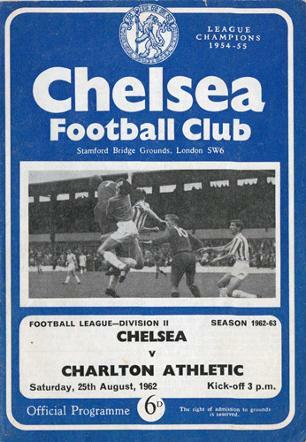 CAFC lost 5-0 to CFC in front of 24,500 fans. 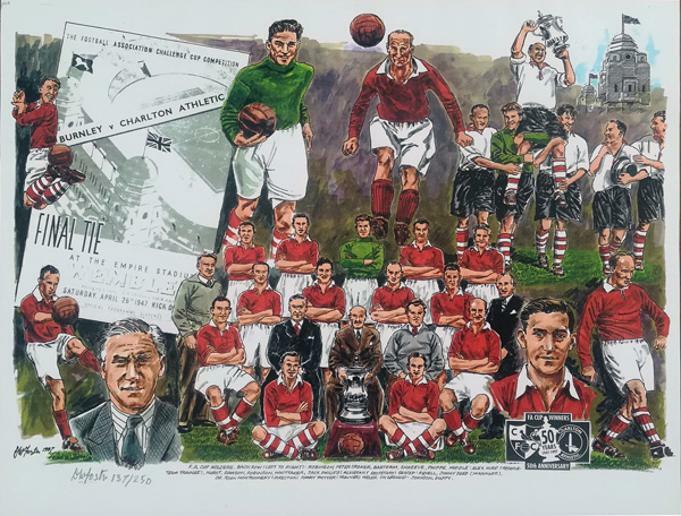 CAFC 1947 FA Cup Final Limited Edition print (137/250) signed by the artist. 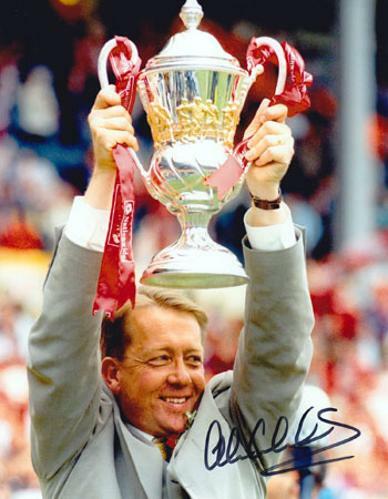 This 50th anniversary framed print (approx 35 x 30 cms) features highlights from the Final including Don Welch's headed winning goal in extra time plus caricatures of the players and manager Jimmy Seed. 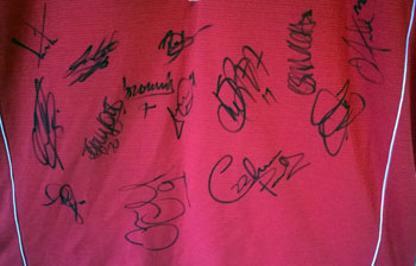 Collection only as under glass. 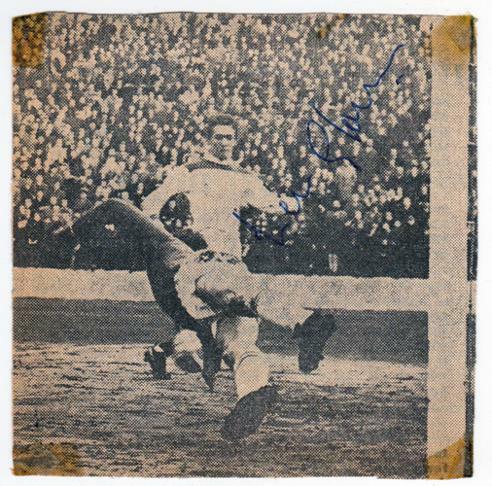 1947 FA Cup Final B&W print. 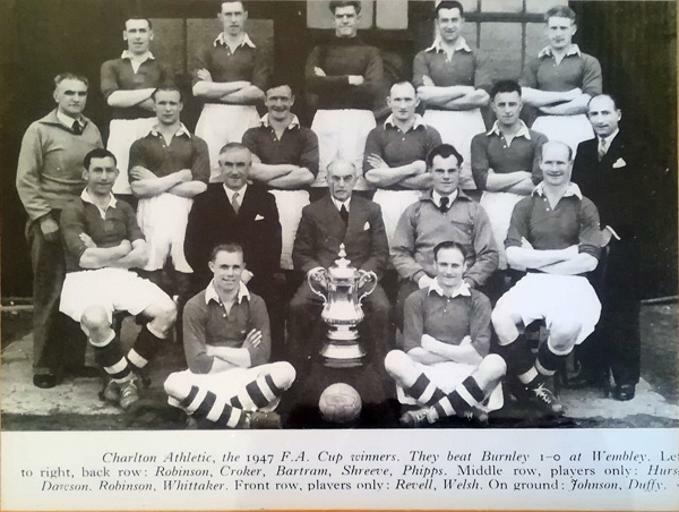 Framed squad pic of players and coaches with the FA Cup trophy after the club's only FA Cup triumph - 1-0 over Burnley at Wembley Stadium. 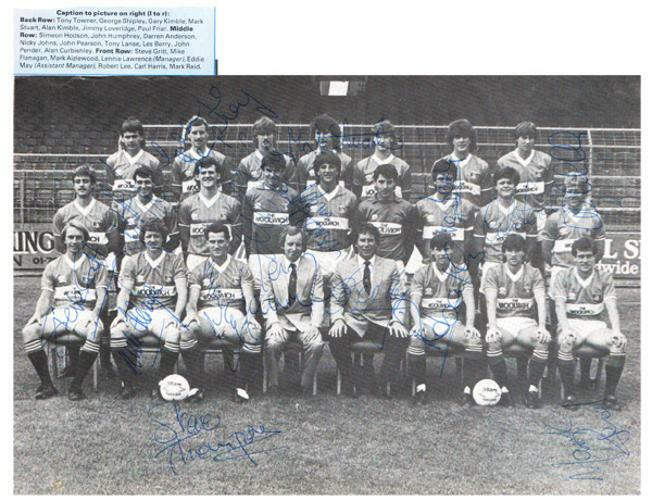 Players featured: Robinson, Croker, Bartram, Shreeve, Phipps, Hurst, Dawson, Robinson, Whittaker, Revell, Welsh, Johnson & Duffy + manager Jimmy Seed. 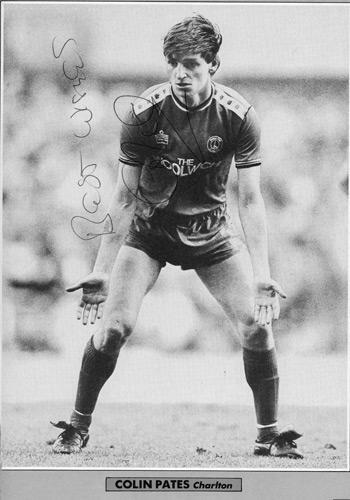 B&W programme team pic signed by 14 players: Alan Curbishley, Steve Gritt, Mike Flanagan, Robert Lee, Les Berry, Nicky Johns, Mark Aizlewood, Mark Stuart, Tony Towner, Paul Friar, Paul Curtis, Steve Dowman, Ronnie Moore & Carl Harris. 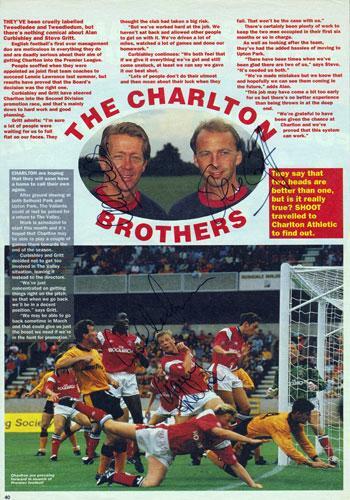 Colour magazine poster page team pic signed by 5 players: Lawrie Madden, Steve Gritt, Les Berry, Phil Walker & Colin Powell (not pictured). 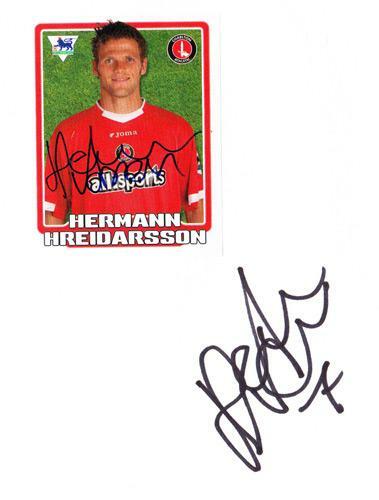 Approx size: 27 x 20 cms. 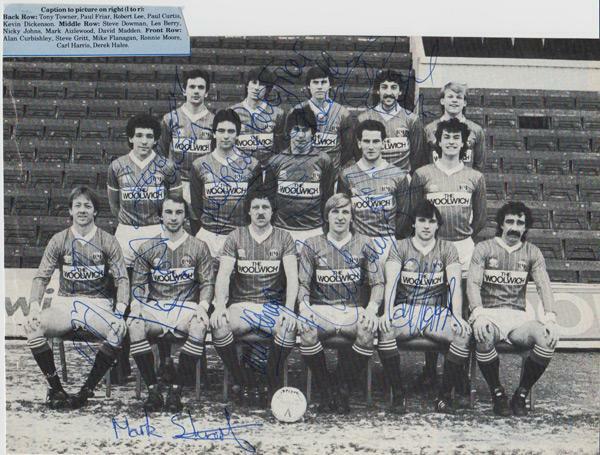 B&W programme team pic signed by 16 players and staff, inc Manager Lennie Lawrence, Alan Curbishley, Steve Gritt, Mike Flanagan, Robert Lee, Les Berry, Nicky Johns, George Shipley, Mark Aizlewood, Mark Stuart + 6 others. 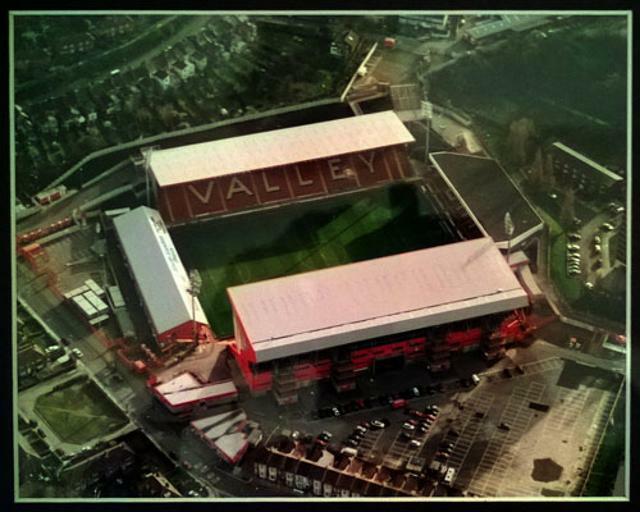 A 1999 Chorley Handford aerial photo of The Valley and surrounding area in SE London. 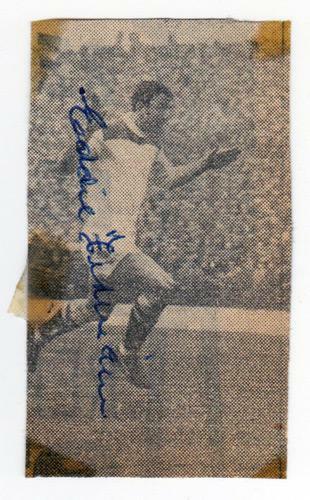 Framed / under plastic glass. 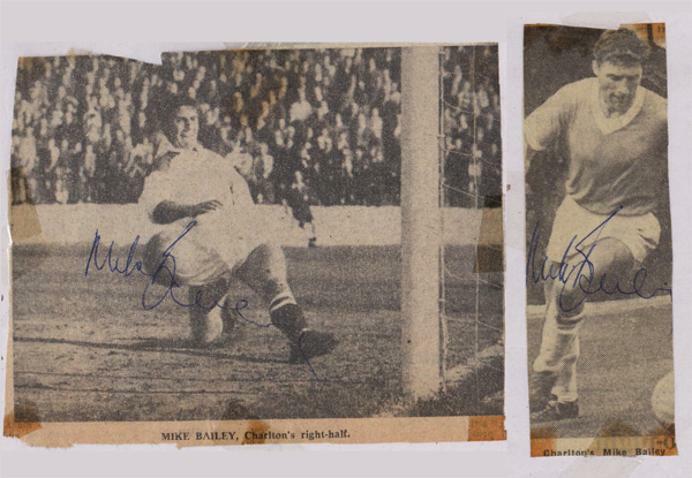 2 x signed 1960s B&W newspaper pics. 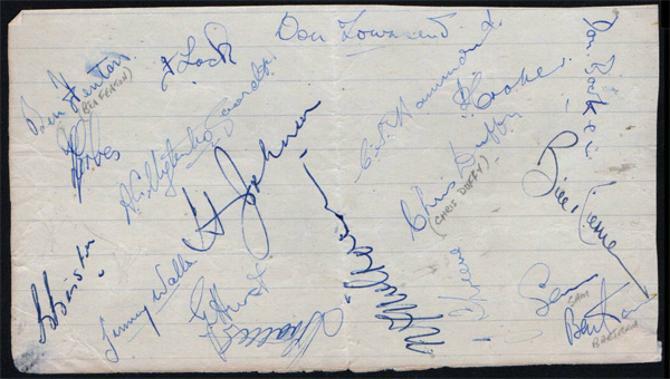 This rare, signed card has some minor folds and creases. 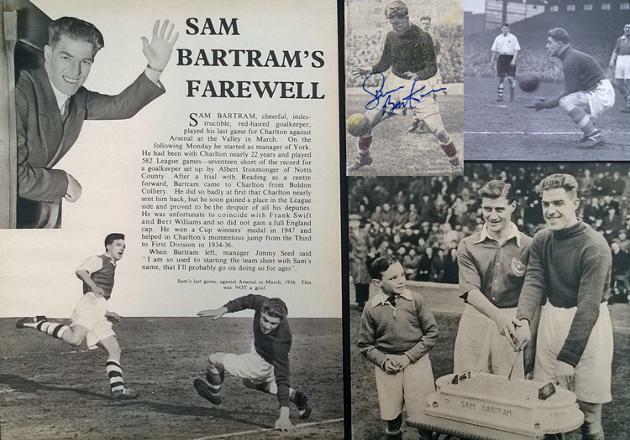 Autographed B&W newspaper picture + B&W action photo + 1957 Football Annual Farewell article & picture. 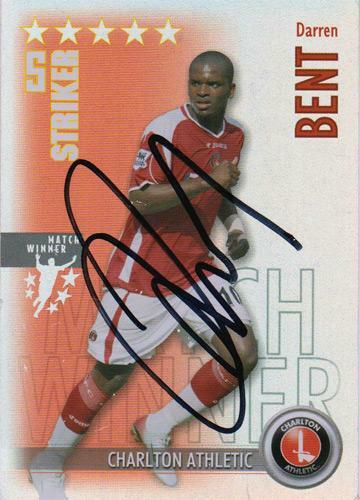 Signed CAFC Match Attax / Match Winner player card. 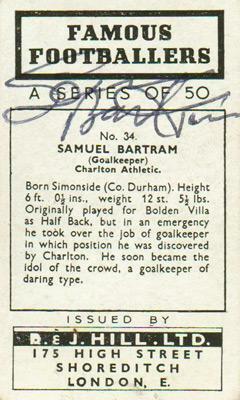 Signed Charlton Athletic "Valley Gold" pull-out. 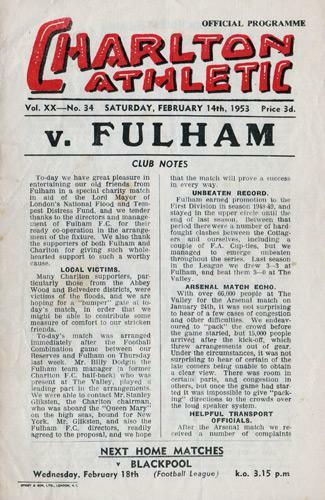 Approx A5 size (four pages). 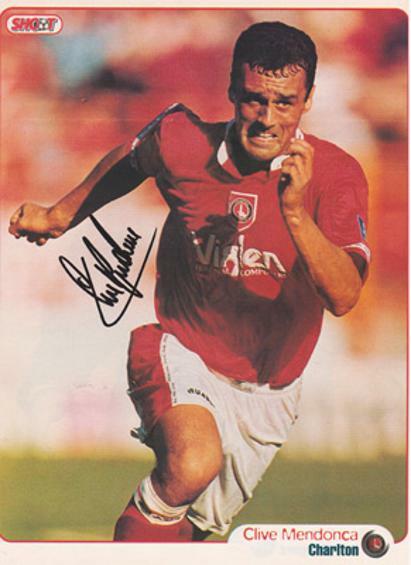 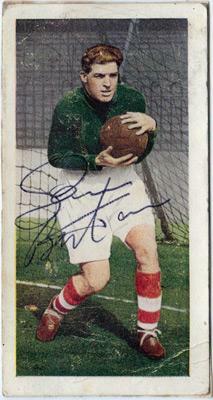 Signed Charlton Athletic colour photo. 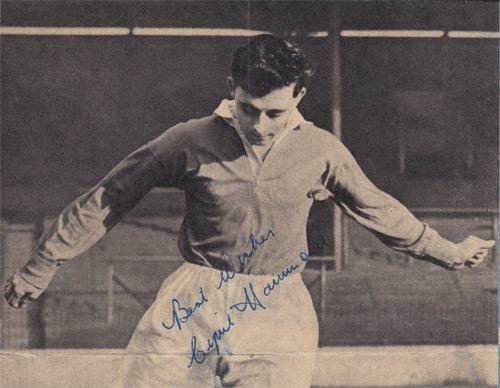 Also signed by Curbs' assistant Mervyn Day. 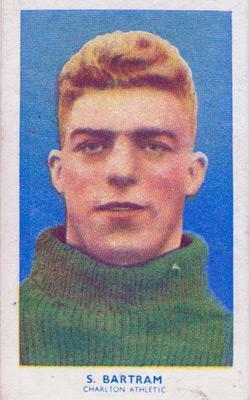 Approx 20 x 25 cms. 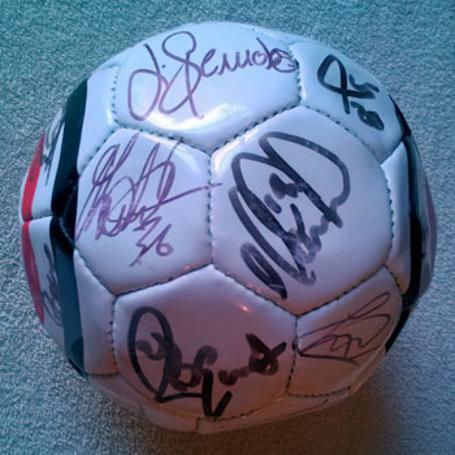 Autographed by Alan Curbishley, Steve Gritt, Garry Nelson and Carl Leaburn. 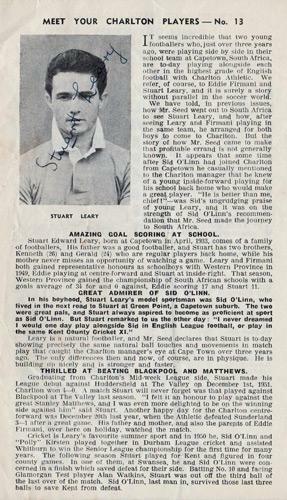 All pictured in the article. 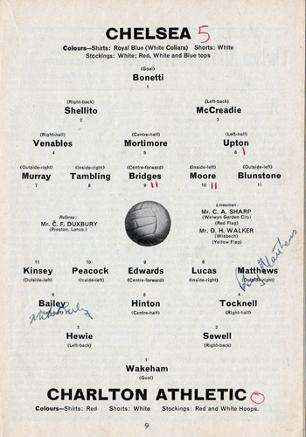 Signed Match magazine poster page. 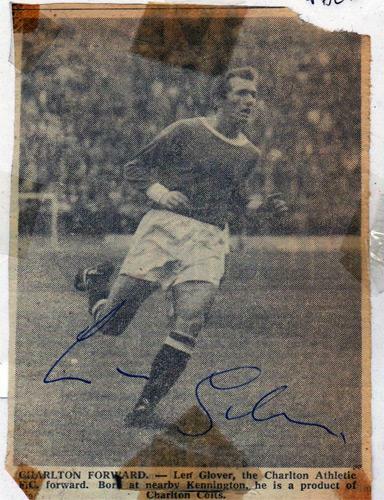 Signed 1960s B&W newspaper pic 1. 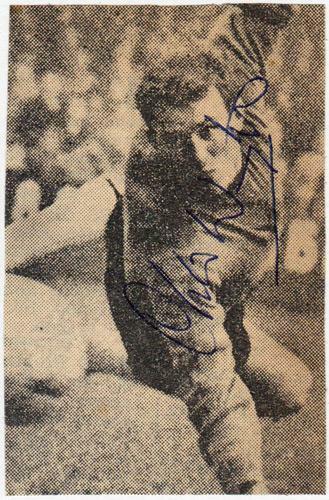 Signed 1960s B&W newspaper pic 2. 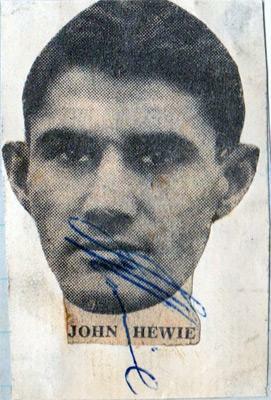 Signed 1950s B&W newspaper pic. 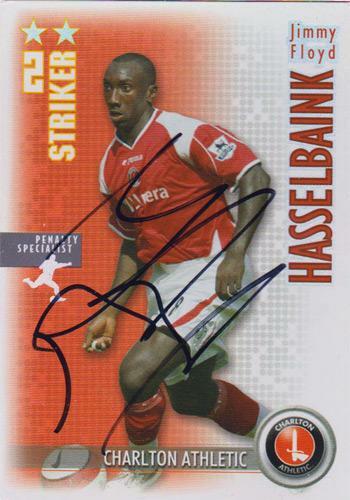 Signed CAFC Match Attax player card. 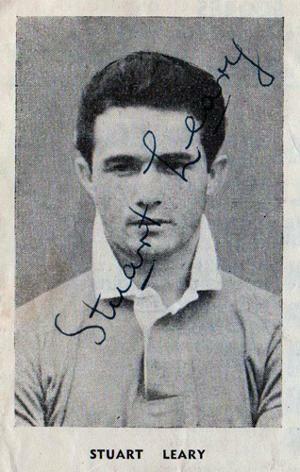 Signed small 1950s B&W newspaper portrait pic. 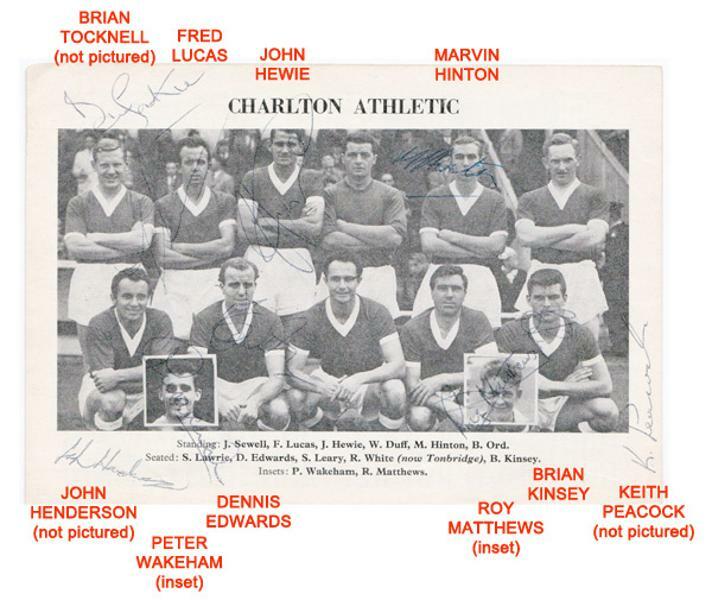 Signed Charlton Athletic football pic. 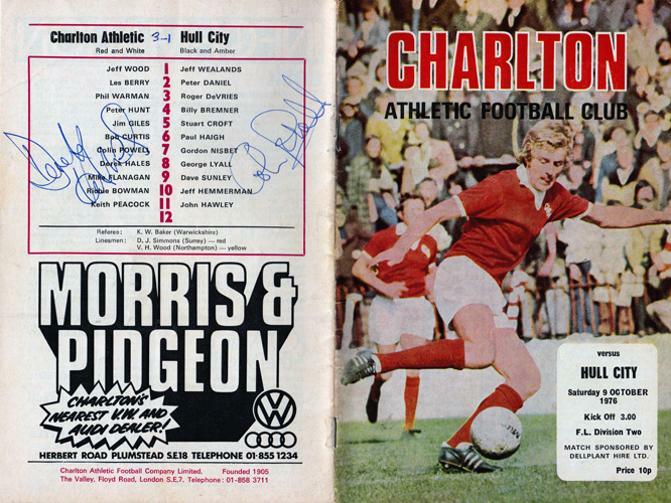 Approx Overall size: 5" x 6.5"
Signed Charlton Athletic football programme. 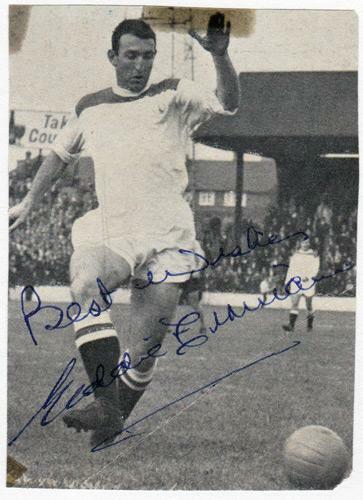 Signed by Stuart Leary (twice) & Ken Chamberlain. 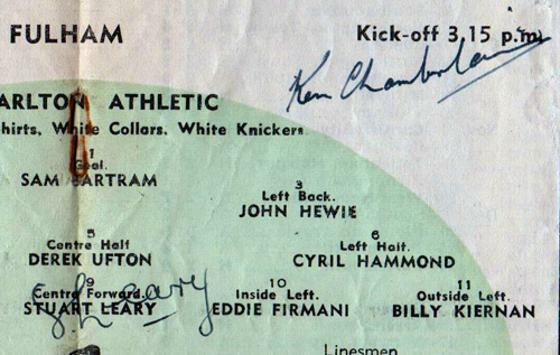 Leary has signed across his name on the team line up in the centre page spread, alongside Chamberlain (not in the starting line up). 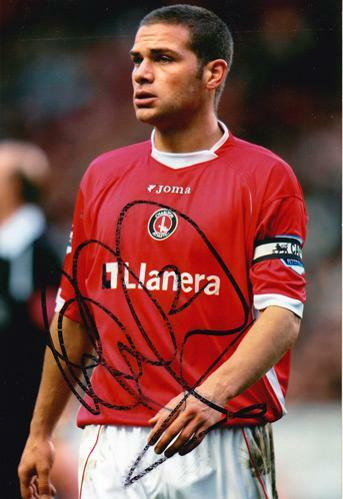 Leary has also signed across his portrait picture for the "Meet Your Charlton Players" profile" article. 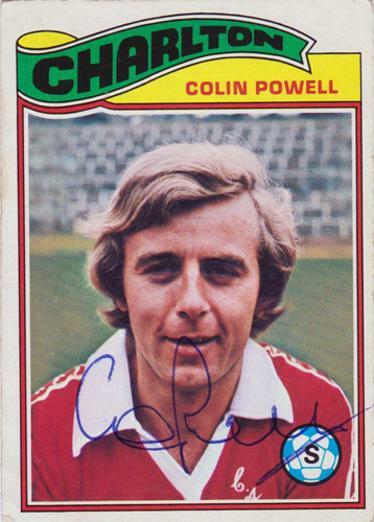 Signed 1978 Topps CAFC Player Card. 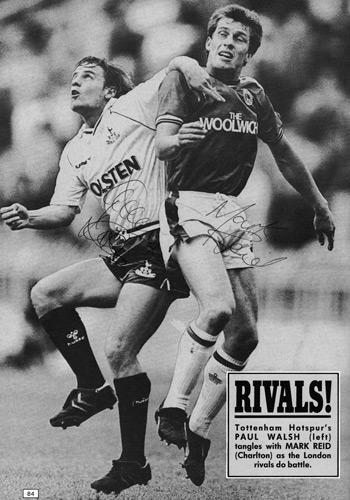 Signed Match soccer magazine poster page. 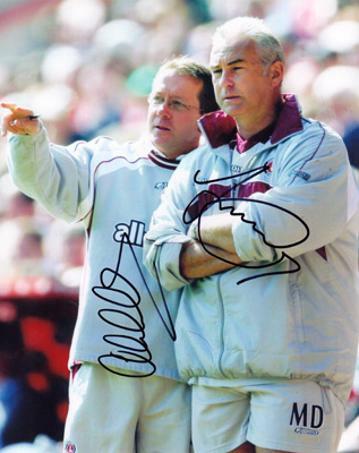 Signed 2007 Valley Review match day programme v West Ham United. 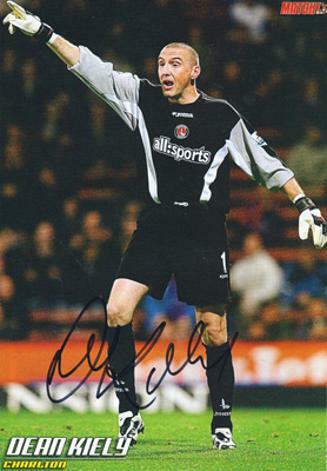 Approx size: 4" x 6"
Signed by the 2005 Charlton Athletic squad. 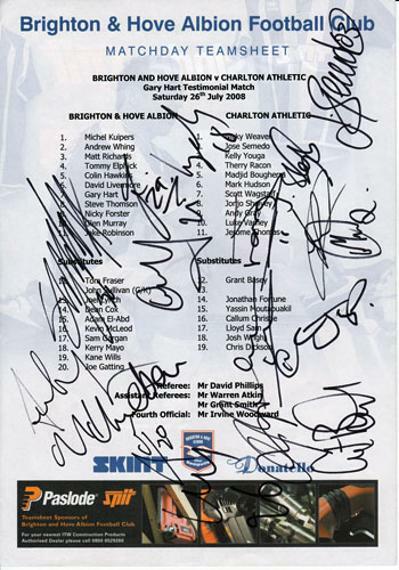 Signed by the 2006-07 CAFC squad. 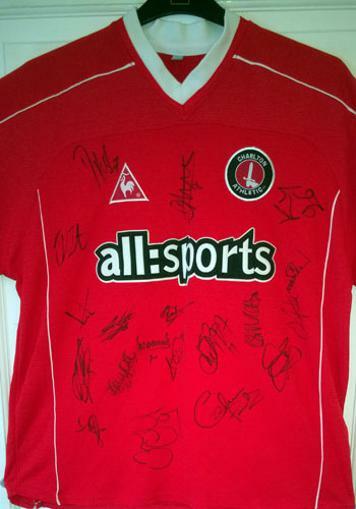 Welcome to Uniquely Sporting Sports Memorabilia page for Charlton Athletic Football Memorabilia & CAFC memorabilia featuring autographs and signed soccer collectables for many of the CAFC Greats, Legends, Players, Managers & Coaches to have graced the Valley over the years.